Tyrie Cleveland may be the most well known threat of the pack, but he’s by no means the only one. 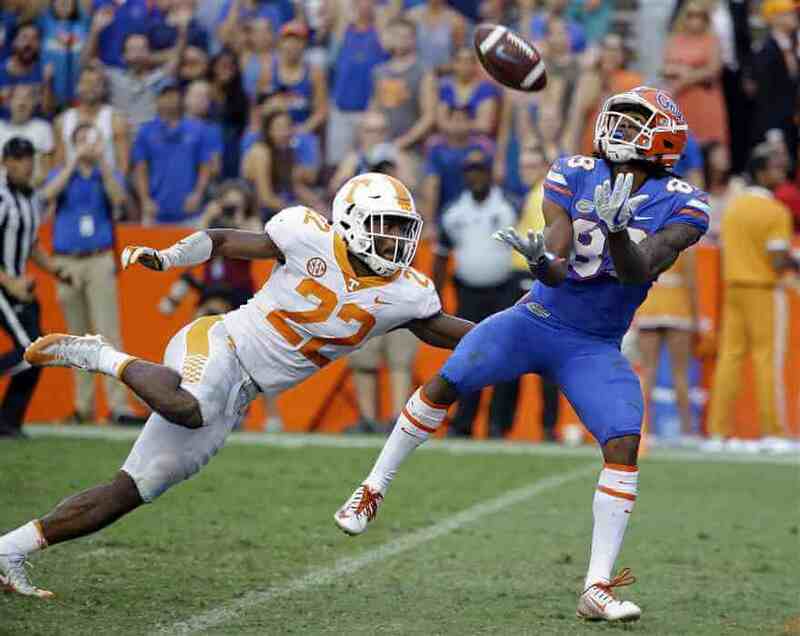 The X receiver: Tyrie Cleveland. Hauling in 410 yards worth of receptions is quite an impressive accomplishment given the nightmare Florida experienced at the QB position last year. Sure, 63 of them came on a play that Tennessee couldn’t be bothered to defend against, but still. Now, Cleveland returns as the most experienced weapon on a roster that’s suddenly full of them, and what sets him apart from the rest is that he’s proven his big play potential on a consistent basis. His excellent route running, sure hands and aggressive catching abilities when in traffic make him a legitimate game changer, and if Florida can finally get some adequate QB play, Cleveland may sneak into the Biletnikoff Award discussion. Jefferson will step onto the field on September 1 against Charleston Southern with exactly 999 career receiving yards to his name, all at Mississippi. What makes Jefferson so difficult for opponents to deal with is his versatility. He’s likely to start the year as the Z receiver, but has lined up in the slot at Ole Miss and could do so again this year pending the health of Kadarius Toney. As explosive as Cleveland is, Jefferson is the more complete receiver and is a better blocker on top of that. He’s a fairly safe bet to lead the Gators in receptions in 2018. There’s no doubting the physical abilities Toney was born with. The questions surrounding him are his intelligence and his health. He’s a human joystick, a real life power up, a perennial cheat code, and whatever other metaphors you personally like to use to describe somebody with incredible shiftiness. He’s a little small, but you can’t tackle what you can’t catch. Assuming he stays healthy- and more importantly, out of trouble- he could finally be the devastating slot option Florida has sorely lacked since Chris Rainey. Trevon Grimes is precisely why you don’t burn bridges with kids on the recruiting trail, and why finishing second in a kid’s recruitment process is never a bad thing. You never know just what’s going to happen. Now Grimes is a Gator, and he brings his big play ability with him. Vertically, he’s every bit as dangerous as Cleveland, although that’s admittedly a conclusion I came to after watching his high school tape, which is less reliable of an indicator than college tape. He’s taller than Cleveland, though, standing 6’3 to Cleveland’s 6’2, and just as fast. Don’t be surprised if Grimes shoots up the depth chart and into a starting role. It will nice when the first thing that pops into your head following the words “Jacob Copeland” is something other than his mom angrily storming out of his college decision announcement after she wanted him to go to Alabama and he picked Florida. But Copeland is so dangerous that this is about one touch away from happening. Youth and a relative unfamiliarity with the college game compared to his fellow receivers will work against him for a little while, but he’s going to be tough to keep on the sideline for too long. He may be a year or two away from becoming a true star, but look for him to have a hand in the offense right away. Florida has an absolute embarrassment of riches at the wide receiver position this year, which means that there’s going to be a ton of talent sitting on the bench. But while injuries are never good, if there’s one place above all else where Florida can afford some, it’s here. In particular, don’t sleep on Dre Massey and the dominant explosive power he can bring to the table. And Hammond and Swain have slightly underwhelmed to this point in their careers, but have two years of experience under their belts and are not wise to write off. Prediction: Florida is absolutely loaded at wide receiver. But unfortunately, this is the unit in football that is most directly dependent on another position (the quarterback) to have success. So how Florida’s receivers do as whole rests squarely on the shoulders of the guy at the controls. Because this is hands down the most talented receiver group Florida has had since the 2008 national championship team. If the Gators get B level or better quarterback play, Florida could be have most explosive passing game in the SEC.